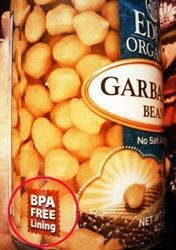 Eden Foods does provide BPA free cans and manufacturers will certainly follow with pressure from greenies like us. Did you know that BPA is one of the most widely used chemicals of all time? In fact, it is probably circulating through your body right now. It is found in the cord blood of newborns and present in 93% of 2,517 Americans age 6 and over, tested by the U.S. Centers for Disease Control and Prevention. Researchers have linked developmental exposure to BPA to reproductive harm, increased cancer susceptibility, and abnormalities in brain development and fat metabolism. Although a total reduction of BPA is impossible, there are things that you can easily do to live a healthier, greener, BPA free life. The following are 5 easy ways you can protect yourself and your family from the harmful effects of BPA exposure. Use Stainless Steel and Glass - A new study in Environmental Health Perspectives says that even some consumer products listed as BPA free still leach hormone like chemicals. To live greener and protect yourself and your family, simply choose as many stainless steel and glass products as possible. Check out To-Go-Ware for stainless container options and do you remember your moms Anchor Hocking? Well it is still around and a great alternative to plastic for storing leftovers. This Down to Earth Anchor Hocking mini bake makes storing and reheating leftovers a cinch. Don't forget, it is imperative that exposure to BPA for babies and children is limited and glass is the best option for bottles. I really love these Lifefactory bottles with the safe, non-toxic silicone sleeve. Wash Your Hands and Then Wash Again! - Did you know that receipts contain large amounts of BPA as does money in your wallet? BPA exposure from receipts has been reported to be almost as high as exposure from plastics. Frequent hand washing throughout the day is imperative to reducing your exposure to BPA. You may even want to refuse your receipts and store them away from money in a separate envelope. Treat Your Plastics Right- “We’ve long cautioned consumers to avoid extreme heat and cooling for plastics, to discard scratched and worn plastics and we feel like this [study] validates one of our many concerns,” says Sonya Lunder, a senior analyst at the Environmental Working Group. Avoid Canned Foods - I know this one is not as easy as the others but consumer reports found that BPA is in the lining of most cans. Eden Foods does provide BPA free cans and manufacturers will certainly follow with pressure from greenies like us. The Ball Corp. is producing custom runs of cans with oleo-based C-enamel linings for Eden and is also doing research to develop more BPA-free can coatings. Know Your Plastics - With a little knowledge, you can easily identify which containers might have BPA. For example, although it may be colored, polycarbonate (BPA laden) is usually clear rather than cloudy. If the container carries a recycling code, it will be marked with the number 7 or the letters “PC,” or both. No. 7 bottles made with BPA-free polyethersulfone (PES) won’t have the PC marking. Other BPA-free plastic alternatives include polyethylene, which may be marked with recycling codes 1 (PET) or 2 (HDPE), and polypropylene, 5 (PP).